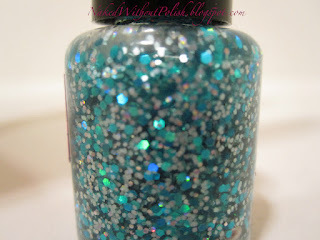 F4 Polish - Ice Cold is a clear base with medium sized icy teal blue holo hex glitter and small white glitter. It's so simple, but it's beautiful! See what I mean?! Gorgeous! I don't think this is a polish that you'd want full coverage with. I think it'd be a bit too much. 1 coat is too little on it's own and 3 coats was overwhelming to me. 2 coats is perfect on a naked nail. I know you all knew what was coming next... what colors I picked to layer this over. I wanted to stay in the blue family for this one. If you all want me to do another mini review and layer it over unconventional colors, just let me know in the comments below. 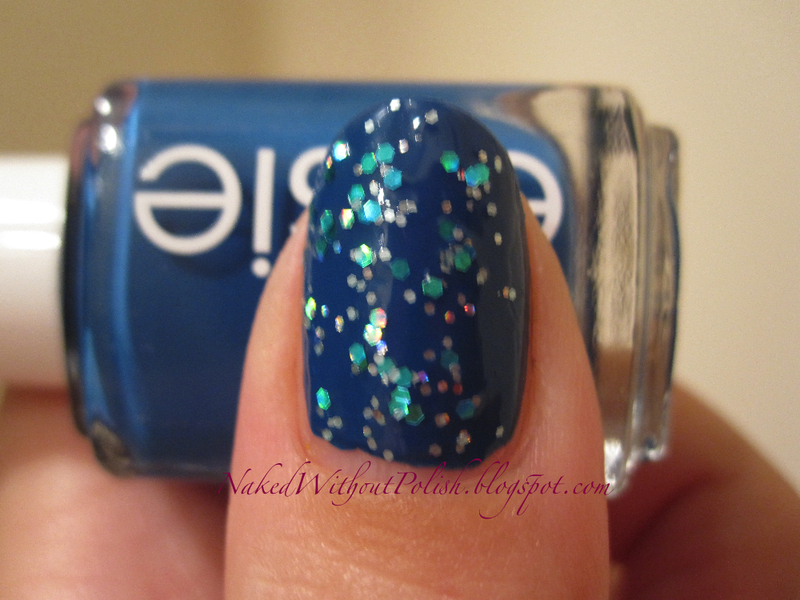 For some reason, I felt like staying true to this polish for this review. Left to Right: Hard Candy - Sky, OPI - Blue Moon Lagoon (black label), Julep - Claire, Finger Paints - Blue Raspberry Taffy and Essie - Mezmerised. As seen above, from pinky to thumb: Hard Candy - Sky, OPI - Blue Moon Lagoon (black label), Julep - Claire, Finger Paints - Blue Raspberry Taffy and Essie - Mezmerised. This is 2 coats of F4 Polish - Ice Cold over 2 coats of Hard Candy - Sky. Sky is a pale baby blue with a lovely iridescent shimmer to it. It's soft and sweet, and I thought it would pair perfectly with Ice Cold. I was right. The only problem I had was that most of the shimmer in Sky went away when I put Ice Cold on. It still makes a lovely combination though. 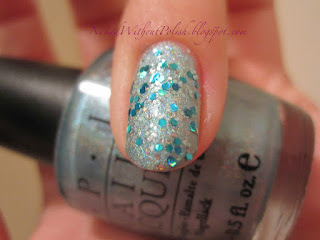 This is 2 coats of F4 Polish - Ice Cold over 2 coats of OPI - Blue Moon Lagoon (black label). 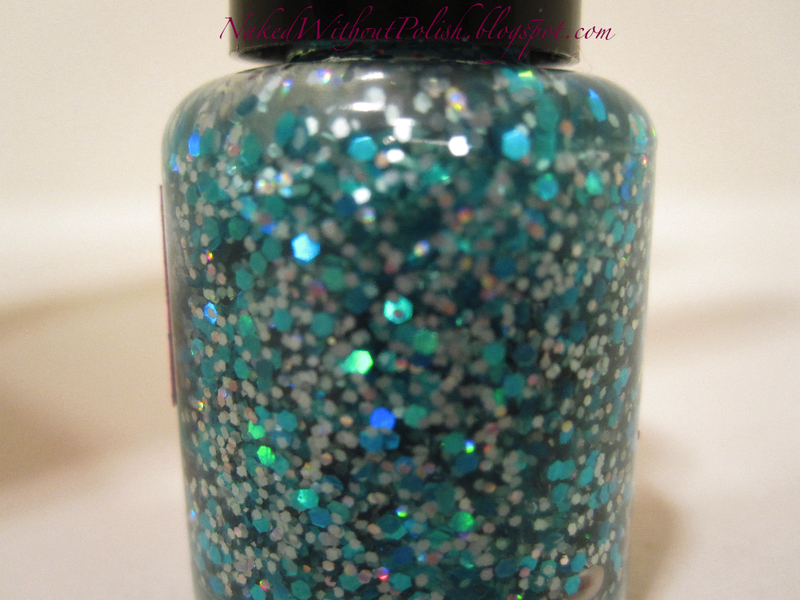 Blue Moon Lagoon is a pale blue linear holo. It's absolutely gorgeous on it's own, and it was perfection paired with Ice Cold! This is probably going to be my go to pairing when I want to wear Ice Cold in a full mani. It probably didn't even need 2 coats of Ice Cold. I could NOT stop staring at this nail though. I was in love! This is 2 coats of F4 Polish - Ice Cold over 2 coats of Julep - Claire. Claire is a sky blue creme. 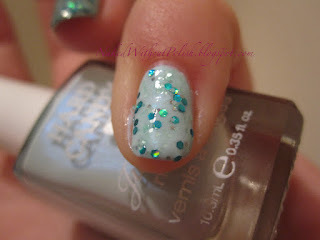 I knew the difference in the sky blue base and the teal holo hexes would be a great contrast. I loved this nail as well, even though I kept getting distracted by the sparkle on my ring finger (we both know you just scrolled up to look at the picture again!). 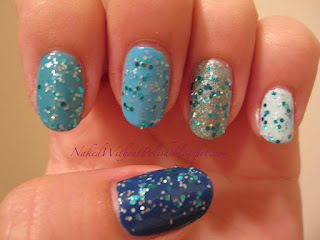 This would be my go to creme or even a lovely accent nail if I did a full mani with Blue Moon Lagoon. This is 2 coats of F4 Polish - Ice Cold over 2 coats of Finger Paints - Blue Raspberry Taffy. Blue Raspberry Taffy is a bit darker than Claire. There's more of a difference on the nail than there is in the bottle. It's more of a darker tealish/sky blue creme than Claire is. The glitter in Ice Cold was a little too similar to Blue Raspberry Taffy for me. They didn't pop like I wanted it to. I definitely prefer Claire to this. This is 2 coats of F4 Polish - Ice Cold over 2 coats of Essie - Mezmerised. Mezmerised is as blue as blue can me. It's a lovely creme. I love how Ice Cold is shown off perfectly over this color. You see it for what it truly is and isn't over powered by the base color at all. I'm so in love with Ice Cold! 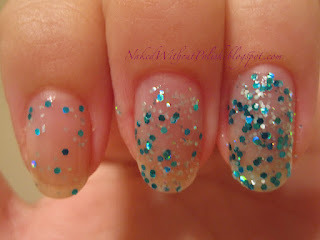 No issues getting the glitter all over the nail or fishing for the hex glitter. 2 coats is perfect with a base color. No issues taking the glitter off either. 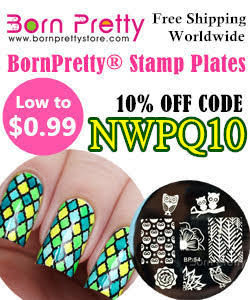 Jenn, Lacey and Lexy really know what they are doing when it comes to their polishes. I've been impressed with every last one of them! 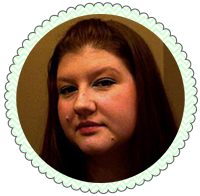 Keep up with news on their Facebook page and stalk their Etsy shop here. They are currently on vacation but will be back around August 22nd. 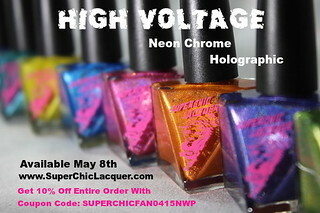 I still have 1 more of their polishes to share with you. So, look forward to that one!